This motherhood gig has been my most rewarding and most draining blessing. It can put me on cloud nine and leave me down in the dumps. Typically, I can experience both of those several times a day, even within minutes of each other (do you have a toddler too??). Patience and grace have never been more needed, nor has coffee, or me-time. I've been thinking a lot lately on what it is that fuels me each day. Where I gain my stamina, focus, and gumption. And I think what I've found is that it revolves around giving myself time to be myself outside of being a mother. Yes, mamas, I'm telling you to use a little bit (or a lotta bit) every day to take care of yourself and give yourself the very grace you willingly (and at time must muster) to your babes. And don't start feeling selfish, because really it's not being selfish at all. I know it's no easy feat to make room for that needed time, especially when you guilt yourself for needing the time in the first place. But, oh how important it is tend to your own needs, and dare I even say, wants, so that you can take care of those precious littles to the best of your human capabilities. Motherhood isn't about perfection or doing it all. It's about reaching for the stars and being okay when you don't even get close. It's having lazy days where you stay in your pajamas with your kids and never make it out of the house or days when you get so much accomplished you feel like super mom. Both days are okay, and both days will inevitably happen. I find when I have a less-than-productive day, I let the guilt of... a) did my child have enough fun? b) was I engaging enough with my child c) am I a bad mom for staying in my pajamas (and happily so) all day? .... weigh me down. That guilt follows me around like a lost puppy, but it's not so cute. And then I end up questioning if I deserve me-time at all. Of course, I do! And so do you! What I'm trying to say is that motherhood/parenthood gives so much to us, but it also takes so much out of us. 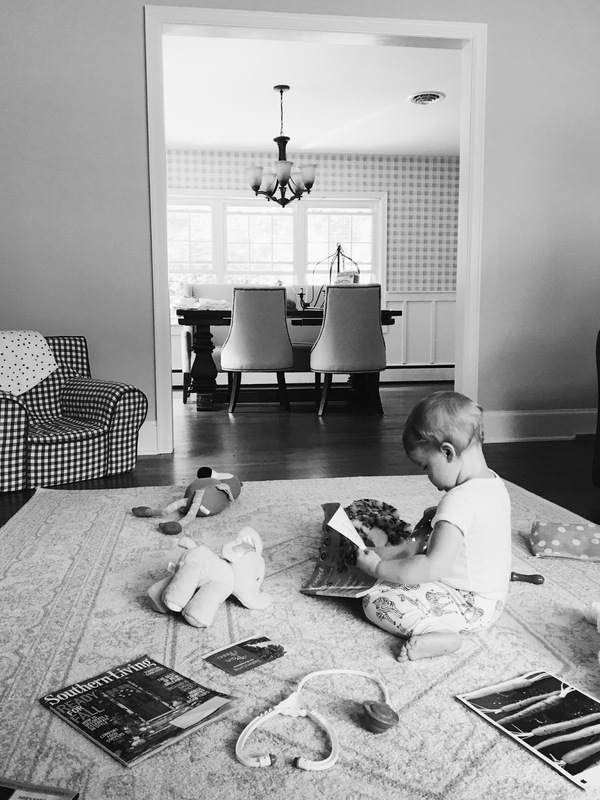 And if you need a little quiet time in the middle of the day to sip on coffee and read a magazine, do it and don't feel bad for letting your little grow their imagination with independent play. You don't have to be on all. the. time. For instance, right now, I'm blogging this while my daughter plays with her dolls and flips through all of my magazines. She's safe, in my sight, knows she can come to me, and most of all is just plain happy. Her little imagination is budding right before me while I take some time for myself so that we can have an exceptional day together instead of dragging through until bedtime. Being a mama is all about compromise. Give of yourself freely to your children and also make the time for yourself. I don't think you can really have one without the other. Some days you'll need a little extra me-time and even a glass of wine of your fourth cup of coffee (because, whoa chaos), while other days you're recharged from the pure wonder of getting to be a mama in the first place. Keep on keepin' on mamas! You've got this more than you know. I'd love to hear the ways you find to recharge yourself and how you make time for your me-time.